The hat is the Bucket Hat from Little Things to Sew (Oliver + S). I used a stiffer interfacing than I've used before on this hat; this one is made by Bosal and I think it was a medium weight fusible interfacing. It made hand stitching the inner cap a little more difficult as the brim is rather wide to hold in your hand without bending it too much, but luckily it turned out fine. I skipped the additional lines of top stitching on the brim; I'm still undecided on whether I'll end up adding those at some point. The dress is the Rollerskate Dress, also by Oliver + S. I made View A, with some modifications. I didn't include the bow on the front, and I also added in a strip of navy blue fabric for the elastic casing (the pattern calls for just one fabric for the outer dress). Making this modification was pretty simple; here's how I did it. Since I was planning to have the navy fabric be just a bit wider than the casing width on the pattern, I didn't worry about modifiying the length of the outer dress fabric; the dress would turn out to be the same length. I planned to cut a strip of navy fabric 2" wide; minus seam allowances this would mean a 1" wide strip of additional length, but since I was also taking away 1" of length from the dress fabric because of the new seam allowances, I would end up with the dress being the same length as the pattern called for. To make my navy piece, I used the original pattern to draw the left and right edges, and then traced along the cut dress fabric to get the top and bottom lines. I did this for each of the back pieces and the front piece. I then sewed the navy fabric to the dress fabric, pressed, trimmed and finished my seam allowances. I was worried about bulky seams distorting the gathering, but in the end decided to finish the seam allowances. I also decided to press the top seam open so as to not add bulk to the bodice and I also did not want the navy showing through the front, but for the bottom I pressed the seam down toward the skirt to reduce bulk in the casing section. After this I followed the pattern directions for the rest of the dress, being careful to line up the navy seams - I love using forked pins for this as shown in the photo below. If you've never tried them I highly recommend them; I use them for piecing quilt top seams as well. Sometimes my helper joined me to work on her sewing; in this case she was sewing a face of her own design on plastic canvas. I used a light soft cotton sateen for the lining and we picked out a green button together to use for the back. I did also add a bit of hand sewing to strengthen a couple of the seams - before sewing the elastic casing I hand stitched at the base of the slit on the back of the dress as it's a point where two different stitching lines meet and with the small gap I was worried about that spot getting pulled and coming apart when she's getting into and out of the dress. I also had to fix a spot on one of the shoulders; as you can see in one of the photos above, the seam allowances around the arms and neckline are quite narrow and the first time she put the dress on she told me she heard a snapping sound - sure enough the seam had started coming apart. Some hand stitching quickly fixed it up and I added a bit on the opposite shoulder in the same place to ensure that one stays together. This was a quick and easy dress to make, even with the modification, and I love how it turned out. Luckily she loves it too! Adorable dress and hat! 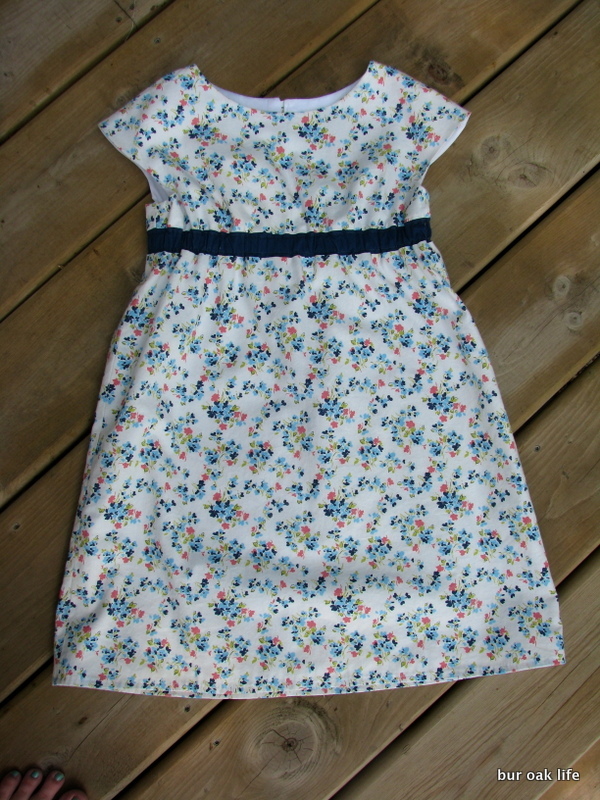 I wish I could sew dresses for my youngest daughter! visiting from finish it up friday. I love love the hat. I love them both and the girl that wears them and the wonderful mom that created them.